Have you ever eaten Quinoa? If not, you need to give it a try. You cook it just like rice. It's a seed, but it tastes more like a grain, and it is really good for you. Among other things, it has 12% to 18% more protein than any grain, contains all nine essential amino acids, it's gluden free, high in fiber, and a good source of phosphorous, magnesium, and iron. I decided to give it a try and substituted it for the rice called for in many of my recipes, like this one. I serve it with grilled salmon, or chicken. In a medium sauce pan, place the quinoa, water and 1/2 teaspoon salt. Cover the pan and cook at a simmer until all of the water has been absorbed by the quinoa -- about 15 minutes. 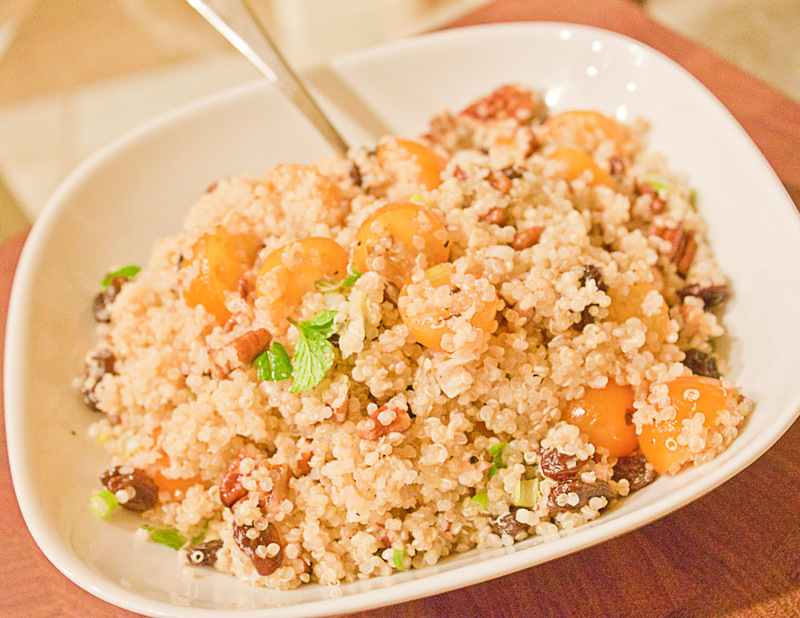 Once the quinoa has cooled, add the tomatoes, raisins, cucumber, green onion, mint, and nuts. Whisk together the lemon, olive oil, sugar, salt, and pepper. Pour this over the quinoa.